In those days a decree was issued by the Emperor Augustus for a general registration throughout the Roman world. This was the first registration of its kind; it took place when Quirinius was governor of Syria. For this purpose everyone made his way to his own town; and so Joseph went up to Judaea from the town of Nazareth in Galilee, to be registered at the city of David, called Bethlehem, because he was of the house of David by descent; and with him went Mary who was betrothed to him. 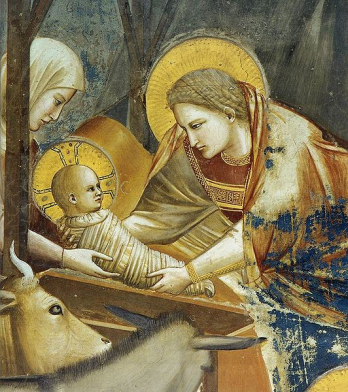 She was pregnant, and while they were there the time came for her child to be born, and she gave birth to her son, her first-born. She wrapped him round and laid him in a manger, because there was no room for them to stay in the inn. Sometimes a story has become so familiar that we don’t see all of its meaning. We may see Mary and Joseph making their long and exhausting journey, and we may see that Bethlehem’s inns were already completely filled with travelers. But we may not see Joseph and Mary’s extreme poverty, or recognize their powerlessness. Yet we must learn to see what their poverty meant, because in Bethlehem of old – just as in our cities today – there was always room at the inn for those who have enough money and influence. Every 14 years, for taxation and military service, Rome conducted a census throughout the empire. Copies of Roman census documents have been recovered from archeological sites in Egypt, covering the years from 20 to 270 CE. Following the 14-year pattern, the census Luke reports would have been taken in 8 BCE.